Read about my experiments with 0 calorie sweeteners and cookies – and what I thought of the end results! By now, you probably have heard of the ketogenic diet. Where you focus on high fat, low carb foods to encourage your body to burn fat for energy, rather than carbohydrates. Many people have found great benefits on this diet, with claims of curing cancer, improving cognitive abilities in people with autism, and lots of claims for weight loss. You can read more about the keto diet here if you’re interested. Now I’ve always been a little skeptical of this diet – I struggle with the concept of cutting out fruit due to the high carb content. Now, I know that you can manage to have fruit on the keto diet, if you’re careful about when and at what time you have it, but I haven’t ever really wanted to look at this as a viable way of eating for me. Until this year. When I have gained a significant amount of weight due to weird hormone issues that I won’t go into! But when both my doctor and a nutritionist friend recommend increasing the amount of fat that I eat, and lowering the amount of carbs, I started to listen. Also, a few people at church have recently started the keto diet and I wanted to bake something for them. So I started investigating natural 0 calorie sweeteners – and two of them were highlighted in almost every place I looked. 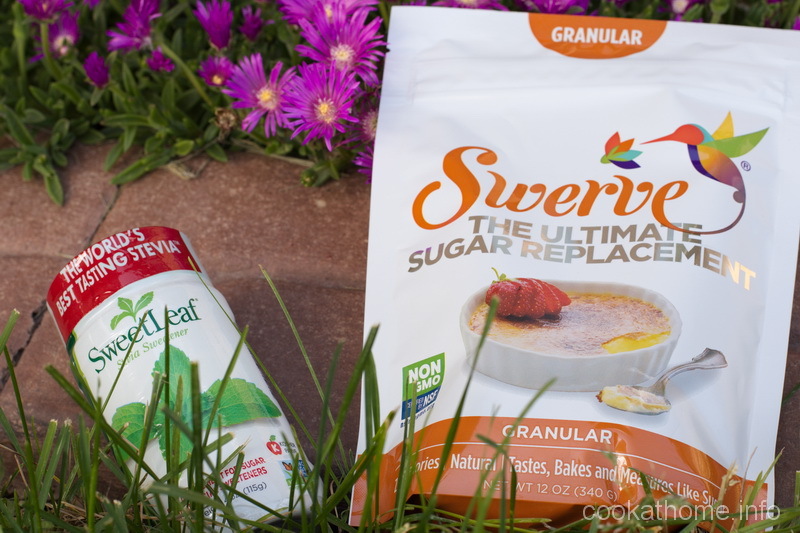 Stevia and erythritol came up trumps every time as a natural 0 calorie, low carb sweetener for keto baked goods. And I went to my local grocery store and bought one of each – thinking that I would make the same recipe with each of them and see which one I liked the best. 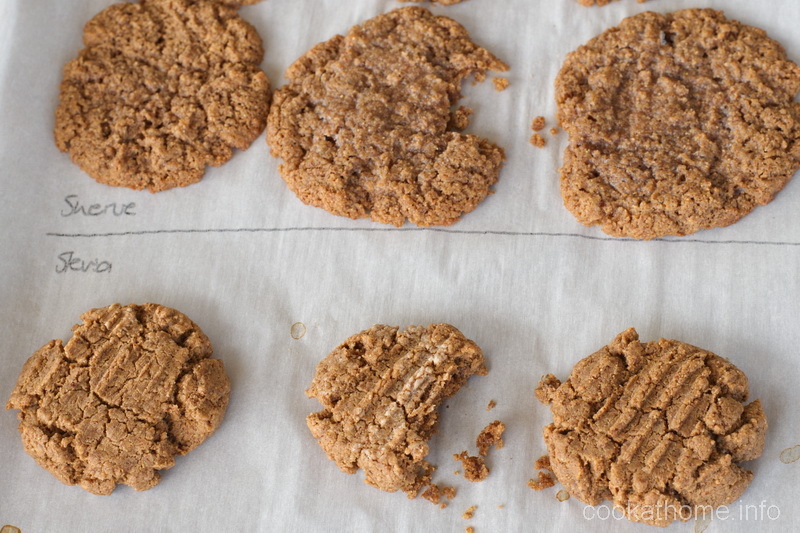 Using my flourless peanut butter cookie recipe as a basis (i.e. 1 cup peanut butter, 1 egg, 1 cup sugar, 1 tsp baking soda), I set out to see which 0 calorie sweetener would taste the best. Mind you, I used almond butter instead of peanut butter, because that’s what I had in the pantry at that time! And I did look at the equivalent amounts of each of them to mimic the appropriate amount of ‘normal sugar’. The Stevia cookies looked like cookies. Pretty similar to what I’ve seen many times over in my kitchen. The Swerve (erythritol) ones spread out a lot more and were quite crumbly. But it all came down to the taste. The Swerve cookies tasted ok. Not great, but ok. The Stevia cookies had this serious metallic taste. I couldn’t even eat one bite of them. And Grant was the same – he actually spat it out into the trash when he tried them. And he’s tried some interesting combinations of mine previously, so that’s saying something! And then I had some really bad stomach cramps that night as well. So let me just say that I may experiment a little more with 0 calorie sweeteners to try to help out the ladies at church, but I’ll take it a little easy … for my stomach and taste buds to recover! Have you had any experience with 0 calorie sweeteners? Let me know which ones you’ve tried and liked in the comments below! Thank you so much for your reply! And all the best for continuing on with the Keto diet and winning! I might try some other ice cream or pudding recipes but it’s a little difficult with my dairy-free requirements as well as a lot of Keto recipes include butter or cream etc. The experimenting is not over, not by a long shot! !